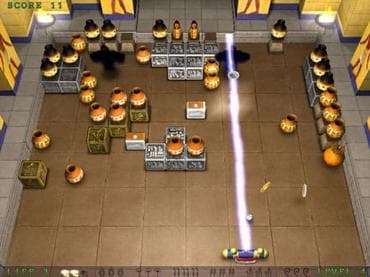 Egyptoball is a perfect Arcanoid game which blends together magician and adventure elements. You investigate 7 deserted temples, find secret treasures, fight ghosts and escape from the evil magician traps. But you are lucky - you have an ancient army, called Egyptoid. Blending it together with the magicians symbols you'll achieve great magic power that none can resist! Download free full version game and enjoy classic gameplay with magic graphics. Free Game Features: - Investigate 7 deserted temples; - Modern 3D graphics; - Extraordinarily addictive game play; - Unique power-ups; - Gorgeous effects, huge explosions! - Original soundtrack and powerful sound effects; - Unique power-ups; - Save / Load game option; - Game statistics; - Free full version game without any limitations. If you have questions about Egyptoball game, please contact us using this form.